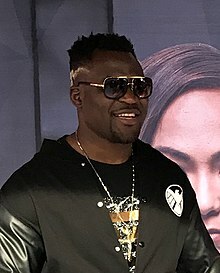 Francis Ngannou (born 5 September 1986) is a Cameroonian-French professional mixed martial artist competing in the Heavyweight division of the Ultimate Fighting Championship. Ngannou currently holds the record for highest punching power ever measured by the UFC at 129,161 units. [specify] He broke the previous record set by kickboxing champ Tyrone Spong which was at 114,000 units. As of February 18, 2019, he is #2 in official UFC heavyweight rankings. Ngannou was born and raised in the village of Batié, Cameroon. He lived in poverty and had little formal education growing up. At 12 years old, Ngannou started working in a sand quarry in Batié because of a lack of funds. As a youngster, he was approached by various gangs in his village to join them. However, Ngannou refused and instead decided to use his father's negative reputation as a street fighter as motivation to do something positive and pursue boxing. At the age of 22, Ngannou began training in boxing, despite reluctance from his family in the beginning. After training for a year, Ngannou stopped training due to an illness. He did various odd jobs to make ends meet, until at the age of 26, he emigrated to Paris, France to pursue professional boxing. After Ngannou reached Paris, he had no money, no friends and no place to live. After living homeless on the streets of Paris, he began training for free in August 2013 under Didier Carmont. Being a fan of Mike Tyson, Ngannou was originally interested in learning how to box until his coach introduced him to the sport of MMA. When I started, I had nothing. Nothing. I needed everything. But when you start [to earn money], you starting collecting things: I want this, I want this, I want that. The purpose is not collecting things, though. The purpose is to do something great. Finish the dream you started. I want to help my family, first, of course, but then I want to give opportunity to children in my country like me who have a dream to become a doctor or something. If I reach my dream, it will give me the opportunity to help those in my country who have their own dreams and nothing else to fulfill them. I want to give some opportunity for children like me who dream of this sport and don’t have an opportunity like me. The last time I was in Cameroon, I brought a lot of materials for boxing and MMA to open a gym. Now I just bought a big space to start the gym, as well. A lot of children now in Cameroon, because of me, they have a dream. They say, ‘I will be a champion in MMA. I will do boxing like Francis,’ because they saw me when I was young. I didn’t have anything. I didn’t have any opportunity. And today, they see me, and they are dreaming. They are thinking that something is possible. Even when they are so poor, something is possible in life. … It's not easy. It's so hard, but it's possible. Ngannou started his MMA career mostly fighting in the French promotion 100% Fight, as well as other regional promotions in Europe. Ngannou made his promotional debut against fellow newcomer Luis Henrique on 19 December 2015 at UFC on Fox 17. He won the fight via knockout in the second round. Ngannou next faced promotional newcomer Curtis Blaydes on 10 April 2016, at UFC Fight Night 86. He won the fight via TKO, due to doctors stoppage, at the conclusion of the second round. In his next bout, Ngannou faced another newcomer in Bojan Mihajlović on 23 July 2016, at UFC on Fox 20. He won the fight via TKO in the first round. Ngannou faced Anthony Hamilton on 9 December 2016, at UFC Fight Night 102. He won the fight by submission in the first round, and earned his first UFC Performance of the Night bonus. Ngannou faced Andrei Arlovski on 28 January 2017, at UFC on Fox 23. He won the fight via TKO in the first round. The win also earned Ngannou his second Performance of the Night bonus. Ngannou was expected to face Junior dos Santos on 9 September 2017 at UFC 215. However, on 18 August, Dos Santos was pulled from the match after being notified of a potential USADA violation. In turn, Ngannou was removed from the card after promotion officials deemed that a suitable opponent could not be arranged. In the highest profile fight of his career, Ngannou faced Alistair Overeem on 2 December 2017 at UFC 218. He won the fight via knockout in the first round. Ngannou fought Stipe Miocic for the UFC Heavyweight title on 20 January 2018 at UFC 220. He lost the fight via unanimous decision. Ngannou faced Derrick Lewis on 7 July 2018 at UFC 226. He lost the fight via unanimous decision. The fight was heavily criticized by the media and the fans for the lack of offence from both competitors and was labeled as "snorefest". Ngannou faced Curtis Blaydes in a rematch on 24 November 2018 in the main event at UFC Fight Night 141 He won the fight via TKO early into the first round. The win also earned him a Performance of the Night bonus. Ngannou headlined UFC's inaugural event on ESPN, UFC on ESPN 1 against Cain Velasquez on 17 February 2019. He won the fight via TKO in the first round. Ngannou is scheduled to face Junior dos Santos on July 6, 2019 at UFC 239. Ngannou is the founder of the Francis Ngannou Foundation which runs the first combat sports gym in his native Cameroon, aiming to offer facilities for young people to pursue their dreams in sports. 2017 Knockout of the Year. Win 12–3 Curtis Blaydes TKO (punches) UFC Fight Night: Blaydes vs. Ngannou 2 24 November 2018 1 0:45 Beijing, China Performance of the Night. Loss 11–2 Stipe Miocic Decision (unanimous) UFC 220 20 January 2018 5 5:00 Boston, Massachusetts, United States For the UFC Heavyweight Championship. Win 10–1 Andrei Arlovski TKO (punches) UFC on Fox: Shevchenko vs. Peña 28 January 2017 1 1:32 Denver, Colorado, United States Performance of the Night. Win 9–1 Anthony Hamilton Submission (kimura) UFC Fight Night: Lewis vs. Abdurakhimov 9 December 2016 1 1:57 Albany, New York, United States Performance of the Night. ^ Sherdog.com. "Francis". Sherdog. Retrieved 17 February 2019. ^ "Francis Ngannou". ufc.com. Retrieved 10 May 2016. ^ Tabuena, Anton (26 November 2017). "Video: Francis Ngannou sets record for punching power". Bloody Elbow. Retrieved 19 February 2019. ^ Tabuena, Anton (26 November 2017). "Video: Francis Ngannou sets record for punching power". Bloody Elbow. Retrieved 19 January 2019. ^ "Fighter Rankings | UFC ®". UFC. Retrieved 19 February 2019. ^ Metro.co.uk, Coral Barry for (23 January 2017). "Fighter In Focus: The UFC's hottest heavyweight prospect is Francis Ngannou". Metro. Retrieved 28 January 2017. ^ a b c "Once homeless on the streets of Paris, Francis Ngannou on the verge of making his dream come true". Retrieved 28 January 2017. ^ a b "Francis Ngannou : l'instinct du combat - L'Equipe Explore". L'Equipe.fr (in French). Retrieved 11 June 2017. ^ a b c "UFC Unfiltered: Francis Ngannou and Fortaleza preview". UFC.com. Retrieved 3 April 2017. ^ a b c "From homeless to UFC contender, UFC on FOX 20's Francis Ngannou recounts his journey". MMAjunkie. 22 July 2016. Retrieved 10 September 2016. ^ Laabi, Mohamed (20 January 2018). "L'incroyable odyssée de Francis Ngannou, l'ancien sans-abris désormais star de l'UFC - Sport24". Sport24 (in French). Retrieved 23 August 2018. ^ Zane Simon (12 August 2015). "Welcome to the UFC, Francis Ngannou & Yusuke Kasuya". bloodyelbow.com. Retrieved 12 August 2015. ^ "Debuting heavyweights Luiz Henrique, Francis Ngannou meet at UFC on FOX 17 in Orlando". MMAjunkie. 2 September 2015. Retrieved 1 December 2017. ^ John Morgan (19 December 2015). "UFC on FOX 17 results: Francis Ngannou smashes Luis Henrique with uppercut". mmajunkie.com. Retrieved 19 December 2015. ^ "Curtis Blaydes in for Bojan Mihajlovic against Francis Ngannou at UFC Fight Night 86". MMAjunkie. 14 March 2016. Retrieved 1 December 2017. ^ Damon Martin (10 April 2016). "Francis Ngannou beats Curtis Blaydes after nasty eye injury stops the fight". foxsports.com. Retrieved 10 April 2016. ^ "Francis Ngannou vs. Bojan Mihajlovic added to UFC on FOX 20 in Chicago". MMAjunkie. 17 May 2016. Retrieved 1 December 2017. ^ Steven Marrocco (23 July 2016). "UFC on FOX 20 results: Francis Ngannou pounds out Bojan Mihajlovic in 94 seconds". mmajunkie.com. Retrieved 23 July 2016. ^ "Anthony Hamilton says he's fighting Francis Ngannou at UFC Fight Night 102 in Albany, N.Y." MMAjunkie. 4 October 2016. Retrieved 1 December 2017. ^ Ben Fowlkes (9 December 2016). "UFC Fight Night 102 results: Francis Ngannou powers his way into submission of Anthony Hamilton". mmajunkie.com. Retrieved 9 December 2016. ^ Mike Sloan (9 December 2016). "UFC Fight Night 102 bonuses: Villante, Safarov, Ngannou, Meerschaert all pocket $50K". sherdog.com. Retrieved 9 December 2016. ^ "Arlovski vs. Ngannou set for UFC on FOX 23". MMA Fighting. Retrieved 1 December 2017. ^ Staff (28 January 2017). "UFC on FOX 23 bonuses: Valentina Shevchenko, Jorge Masvidal among $50,000 extra winners". mmajunkie.com. Retrieved 29 January 2017. ^ Marc Raimondi (28 June 2017). "Junior dos Santos vs. Francis Ngannou official for UFC 215". mmafighting.com. Retrieved 28 June 2017. ^ "Junior dos Santos pulled from UFC 215 due to potential USADA violation". MMA Fighting. Retrieved 18 August 2017. ^ Dave Doyle (28 August 2017). "Francis Ngannou is officially off UFC 215". mmafighting.com. Retrieved 28 August 2017. ^ Staff (28 August 2017). "UFC 215 lineup set with 2 title fights in Edmonton, including Demetrious Johnson's quest for record". mmajunkie.com. Retrieved 28 August 2017. ^ Tristen Critchfield (27 September 2017). "Heavyweight contenders Alistair Overeem, Francis Ngannou set to clash at UFC 218". sherdog.com. Retrieved 27 September 2017. ^ Campbell, Brian (3 December 2017). "UFC 218 results: Francis Ngannou flattens Alistair Overeem with vicious KO". CBSSports.com. CBS Broadcasting, Inc. Retrieved 3 December 2017. ^ "Stipe Miocic slated to defend heavyweight title against Francis Ngannou at UFC 220". MMA Fighting. Retrieved 7 December 2017. ^ "UFC 220 results: Stipe Miocic bests Francis Ngannou in lopsided decision". MMA Fighting. 21 January 2018. ^ Henken, Michael (20 April 2018). "Report: Francis Nagnnou vs. Derrick Lewis Set For UFC 226". LowKickMMA.com. Retrieved 20 April 2018. ^ "UFC 226 results: Derrick Lewis beats Francis Ngannou in extremely awful 'fight'". Bloody Elbow. Retrieved 8 July 2018. ^ "UFC 226: Joe Rogan savages 'most boring heavyweight fight of all time' between Francis Ngannou and Derrick Lewis". Retrieved 8 July 2018. ^ Cillian Cunniingham (16 August 2016). "Curtis Blaydes/Francis Ngannou rematch set for UFC Beijing". punditarena.com. Retrieved 16 August 2016. ^ Rondinone, Troy (20 April 2017). "Fight Night". University of Illinois Press. 1. doi:10.5406/illinois/9780252037375.003.0001. ^ Jon Fuentes (24 November 2018). "UFC Beijing Bonuses: Ngannou & Jingliang Bank $50k For Finishes". lowkickmma.com. Retrieved 24 November 2018. ^ Damon Martin (22 December 2018). "Cain Velasquez Returns to Face Francis Ngannou in First UFC on ESPN Main Event". mmaweekly.com. ^ "UFC on ESPN 1 results: Francis Ngannou stuns Cain Velasquez in just 26 seconds". MMAjunkie. 18 February 2019. Retrieved 18 February 2019. ^ Youngs, Jose (29 March 2019). "Francis Ngannou vs. Junior dos Santos slated for UFC 239". MMA Fighting. Retrieved 30 March 2019. ^ "UFC heavyweight Francis Ngannou opens 'first full MMA' gym in Cameroon". mmajunkie.com. 14 January 2019. ^ Snowden, Jonathan. "Bleacher Report 2017 MMA Awards: Best Fighter, Fight, Finishes and Story". Bleacher Report. Retrieved 3 January 2018. ^ "ESPN's MMA awards for 2017: The fight, submission and knockout of the year". ESPN.com. Retrieved 3 January 2018. ^ "Pundit Arena's 2017 UFC Awards - Pundit Arena". www.punditarena.com. 28 December 2017. Retrieved 3 January 2018. ^ "MMA Fighting's 2017 Knockout of the Year: Francis Ngannou's 'uppercut from hell' crushes Alistair Overeem". MMA Fighting. Retrieved 4 January 2018. ^ "MMA Fighting's 2017 Breakthrough Fighter of the Year: Francis Ngannou". MMA Fighting. Retrieved 8 January 2018. ^ "MMAjunkie's '2017 Knockout of the Year': A head-rattling heavyweight finish". MMAjunkie. 7 January 2018. Retrieved 8 January 2018. ^ DNA, MMA. "MMA DNA UFC Awards 2018 : De Uitslagen!!!". Retrieved 28 January 2019. ^ Sherdog.com. "Francis". Sherdog. Retrieved 24 November 2018.